During this season of thanks and reflection, the 2016 Young Leaders of the Americas Initiative (YLAI) fellows have a lot to be grateful for this year. Not only did 248 young business and social entrepreneurs and civil society leaders travel to the U.S. for a 5 week fellowship program sponsored by the U.S. Department of State, but 62 fellows were selected to attend supplemental YLAI programming in Lima, Peru on November 18 and 19. On Friday, November 18, the fellows participated in summit programming at the Universidad Peruana de Ciencias Aplicadas. The fellows heard from Gaston Acurio, Peruvian restaurant owner; Andy Rabens, Special Advisor for Global Youth Issues at the U.S. Department of State; and Richard Stengel, Under Secretary for Public Diplomacy at the U.S. Department of State. During a reception, the fellows also heard remarks from Acting Assistant Secretary for the Bureau of Western Hemisphere Affairs at the U.S. Department of State, Mari Carmen Aponte. The fellows attended a Presidential Town Hall on Saturday, November 19 at the Pontificia Universidad Católica del Perú. 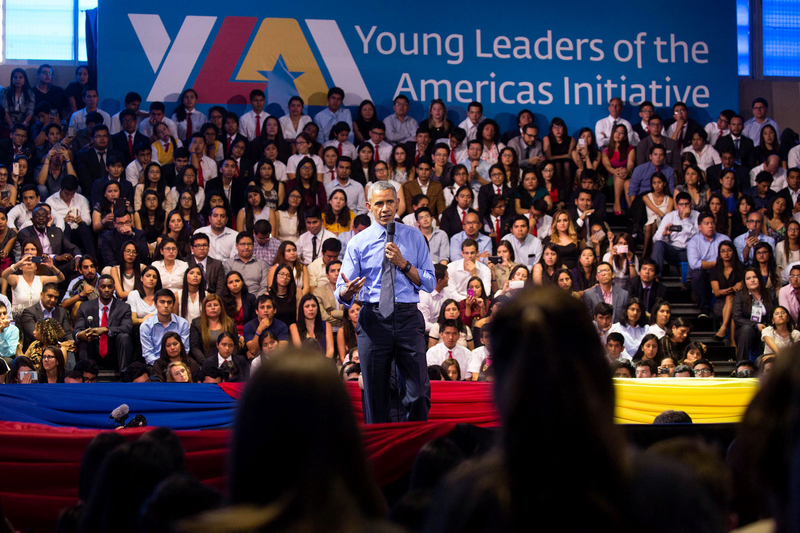 Fellows had a front-row seat as President Barack Obama answered questions from audience members and discussed topics including women’s empowerment, the presidential transition in the United States, and the importance of the YLAI Network throughout the hemisphere. YLAI Fellow Cyntia Paytan from Peru introduced President Obama, and she participated in multiple interviews following the event, granting more visibility to her organization Sonqo and Maqui. YLAI Fellows in the audience were also impacted by the experience. Oscar Tadeo from El Salvador said that President Obama’s speech motivated him, and he plans to use the knowledge from YLAI to help other young people in El Salvador start their own ventures. Following the Town Hall, the fellows returned to their home countries, inspired to continue to advance and grow their businesses and organizations and make a positive impact in their communities. These fellows participated in the Young Leaders of the Americas Initiative (YLAI) Professional Fellows Program, which brought entrepreneurs and civil society leaders to the United States for a five-week program. This U.S. Department of State-sponsored program empowers these young entrepreneurs to strengthen their capacity to launch and advance their entrepreneurial ideas and to effectively contribute to social and economic development in their communities. For more information about YLAI, please contact Evan Kindle.